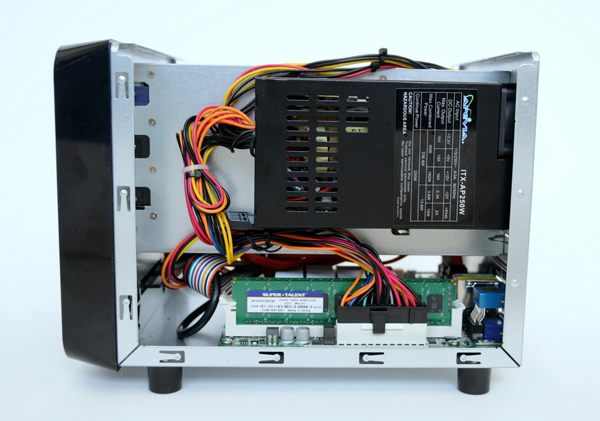 Today we’re taking a look at the newly released Norco ITX-S4, a $99 Mini-ITX based server case with four hot swap bays, an internal 2.5” bay and full height PCI expansion slot. While the primary market for this case is undoubtedly Home Theater PC (HTPC) and NAS appliance scenarios, I wanted to go beyond simple NAS or HTPC with the capabilities that Intel’s Avoton offerings now provide. I have put together a low power, high capacity “flex” server build as a proof of concept for the ITX-S4, to see just how much functionality I could cram into this little box. For this test we decided to use a fairly standard Intel Avoton platform. This is likely the direction many of the larger NAS players are going in the next year so this is significantly ahead of the older Atom chips in terms of utility. Installation consisted of Windows Server 2012 R2 Standard, which includes 2 free Hyper-V virtual machines. The VM files were stored on the SSD (Drive C:), and configuration of the four 4TB disks consisted of Stablebit DrivePool for pooling disks 1 – 3 into a single 12TB volume (Drive D:), and disk 4 configured as a parity disk with the excellent and free SnapRAID software. It’s worth noting I’ve been very happy with the DrivePool + SnapRAID combo, this coming from someone that’s been a hardware RAID diehard. This combination really excels at protecting large media libraries – data that typically changes only very infrequently. The nuts and bolts of configuring this software is beyond the scope of this review – and more in formation is available here in the forums – but suffice to say it has been working perfectly during the week evaluating this build. 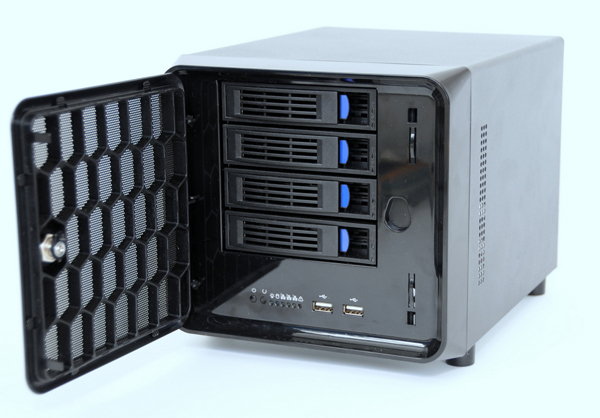 The front of the Norco ITX-S4 has 4x 3.5″ hot swap drive trays hidden behind a locking screen. This helps keep the drives secure against unwitting prying fingers. Two front USB ports are blocked when the door is closed but can still be used to hook up a keyboard and mouse if needed. The fifth drive spot is for a 2.5″ SSD. This can be used either as a cache disk or a boot drive depending on the configuration. 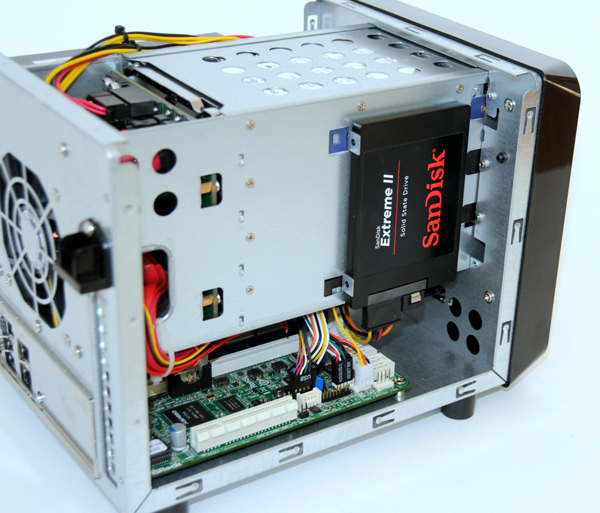 Unlike the 3.5″ drives, this is not a hot-swap drive slot. One can see there is adequate clearance and the mounting is fairly straightforward. 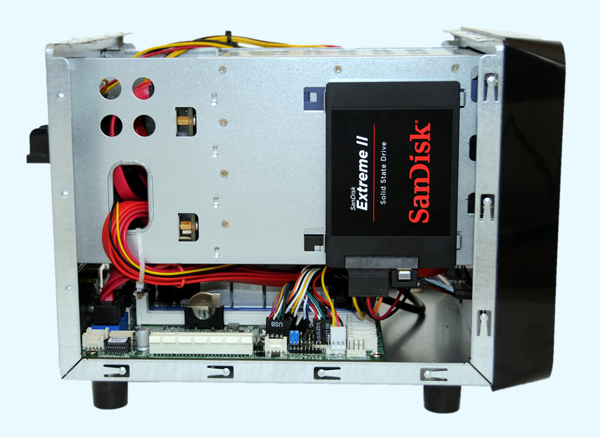 One can also see that the mITX expansion slot can be utilized with a full-height card, although depth may limit some applications. 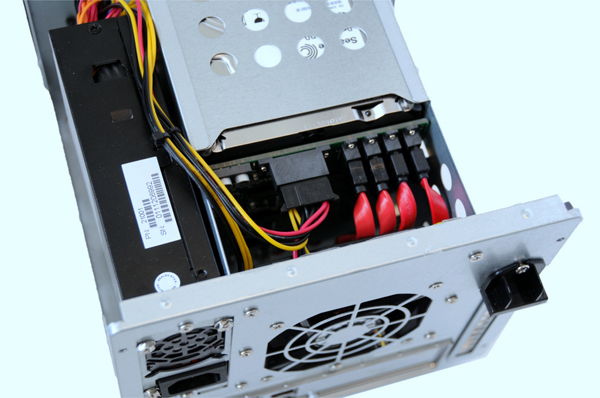 The FlexATX power supply is mounted on the other side of the chassis. 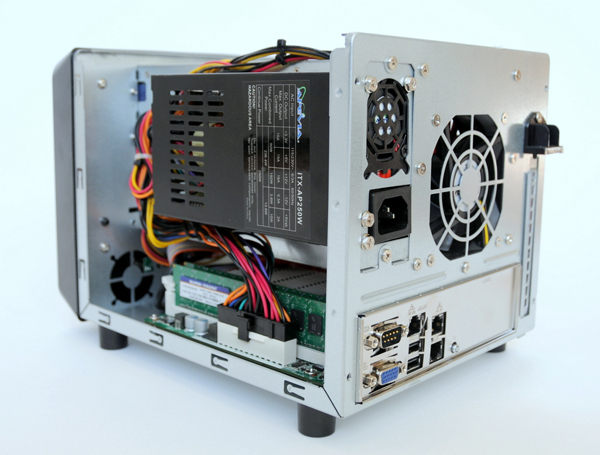 To keep the form factor compact, a smaller power supply is used. One of the benefits of low power builds is that power supplies tend to be cooler and quieter than larger builds. The power supply sits above the motherboard. 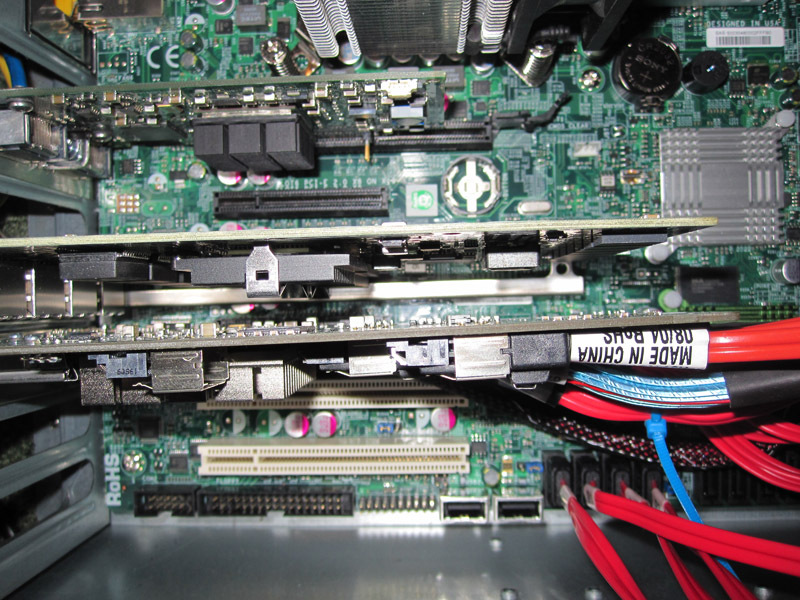 One can see that on the ASRock motherboard the ATX power connector is still accessible from the side of the case. Looking above at the power and SATA connectors, one can see that there is a PCB backplane that provides hot-swap capability in the chassis. Overall this is a simple and clean design. One minor complaint was the stock cooling fan is on the noisy side because it is high CFM, the same fan employed in Norco’s rackmount server cases. So I installed a Zalman fan controller to dial it back a bit. Drive temps were still fine. An alternative would be to replace it with something like a Silverstone SUSCOOL81. Usage: This server handled multiple 30MBps media streams to several client nodes, media transcoding, parity generation, and two Virtual Machines all without breaking a sweat and being nearly inaudible. Power Consumption: 22 Watts at idle with drives spun down, and 58 Watts during a CPU intensive operation with all disks working. The ITX-S4 marks a great entry into Norco’s small form factor offerings, and a good value at the $99 pricepoint. I like the fact the drive trays are identical to those in Norco’s higher density rackmount based cases, which allowed me to swap drives back and forth easily as I was populating data. Going forward I hope to see Norco add an 8 bay offering to its lineup, as I’ve been urging them to consider both 4 and 8 bay offerings for some time now, given the growth in the home server and HTPC segments. It is worth noting that Norco has done a lot to revolutionize this segment, as prior to the release of the Norco RPC-4020 case way back in June of 2008, the only alternative for people building servers for large media collections was noisy and expensive enterprise class cases, or “5-in-3” drive modules that installed in plain old tower cases and were generally cumbersome. First Look: Norco 2U and 4U JBOD and SAS Expander Chassis Releasing Next Week! While the design of this case is very neat, there are some glaring issues with how it is constructed, with catastrophic results. I purchased one case which I proceeded to assemble and had issues sliding hard drives, mounted in the supplied drive sleds, into the enclosure. They just don’t line up quite right. After fighting with it and not having the installed drives recognized, the machine refusing to boot with drives installed or rebooting when drives were inserted while it was running. I realized that the case/backplane was shorting out the hard drives and frying the controller boards on them. I notified Norco, who shipped out a new case… WHICH HAD THE EXACT SAME ISSUE! I disassembled the case and illustrated the misalignment of the backplane circuit board to their representative, who repeatedly claimed that no one else had experienced this issue. The backplane circuitboard works just fine outside of the case, but mounted in the case, it doesn’t line up to the sata ports correctly and makes inserting drives difficult. The uninsulated drive sleds are slightly bowed on both units and rest against the bare circuit board of the drive… that coupled with the backplane misalignment is most likely the root of the issue. I hope that is true, because my experience has been nothing but heartache. You have been warned. Thanks, Patrick, for the fine review. I have plans for this case and an Asrock ITX board as my new HTPC/home server. There aren’t many reviews on this case and I imagine that spacing is tight for a CPU cooler. Which one did you use and how did it perform for you? I bought this case and it has worked decently for me. I only have one problem with it. The drive sleds connect to the sata ports just fine but the blue tinted latches that lock the drive sled in place are cheap and pop out as soon as you try to lock the drive sled in place. It does not do this without a drive in it but it does when a drive is screwed into the drive sled. There is just to much tension on the on the locking mechanism with the drive to stay locked in place. The drive does not disengage the sata port but the cosmetics of it is very undesirable and not what I payed for. I am going to attempt to glue one of the cheap latches on the latch arm and see if it will stay in place. I would be interested in this chassis, but does it fit A Quadro K1200 (length, hight) ?